Send newsletters and mass emails to your customers! Using Email Sender Deluxe, sending out personalized newsletters and bulk email to your customers and users is very easy! Just choose your recipients, type your mail and click Send! You can quickly import recipients from databases, Excel, text files or enter them manually. You can save email templates in both HTML and text format, so you don’t have to type the whole email again the next time. Email Sender Deluxe Free and Safe Download! Email Sender Deluxe Latest Version! 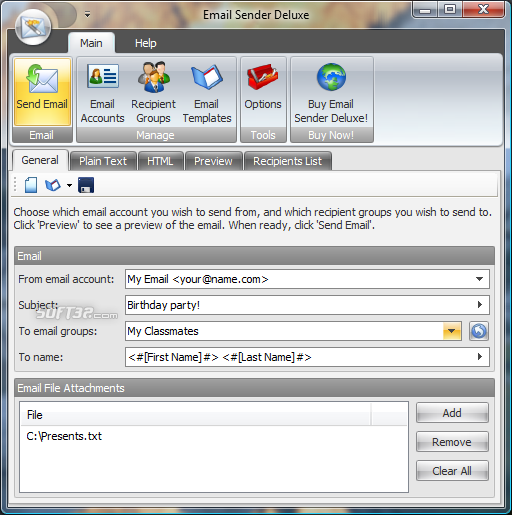 Email Sender Deluxe is a product developed by Kristanix Software. This site is not directly affiliated with Kristanix Software. All trademarks, registered trademarks, product names and company names or logos mentioned herein are the property of their respective owners. Our site contains unmodified software, obtained directly from Kristanix Software website, and does not modify it in any way. All of the files on this website have been found in open sources on the Internet and stored here with an intention to preserve and maintain. The systems hosted on our site are outdated or no longer existent on the market. QP Download is strongly against the piracy, we do not support any manifestation of piracy. If you think that app/game you own the copyrights is listed on our website and you want to remove it, please contact us. We are DMCA-compliant and gladly to work with you. Please find the DMCA / Removal Request below.